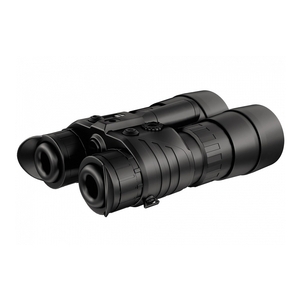 Pulsar Edge GS 3.5x50 L CF Super Nightvision Binoculars. The Edge L range of Gen Super/CF-Super image intensifier tubes which provide edge-to-edge resolution performance, offering a 20% increase in resolution over Gen 1 tubes. The 780nm eyesafe laser IR illuminator provides extended viewing ranges up to 220m. Don't be fooled by the 'Gen1', these are very good. Each lens requires individual focusing; sounds awkward but easy to get used to &amp; allows you to have one focused near, one far (brain quickly adjusts); useful. 3.5 mag ideal, giving an excellent field of view. Most remarkable is battery life; tubes stay activated for some time after switch-off, so not necessary to have the unit switched on permanently. Overall, absolutely worth the money; puts much more expensive kit to shame!